This opinion piece was published in Corriere Della Sera and Bruegel. The coalition agreement signed in May between the Five Star Movement (M5S) and the League foresees new large spending items – most notably the flat tax, a pension reform, and some form of universal basic income – which are unsettling bond vigilantes and rating agencies. In the proponents’ view, these measures are needed to reduce Italy’s notoriously high tax burden and alleviate poverty and inequality. While these are laudable goals, in a country characterised by a debt-to-GDP ratio north of 135%, only a significant boost in GDP or the application of spending restraints elsewhere could fund these measures. Indeed, as pointed out by Giavazzi and Alesina several times, Italy’s Achilles’ heel remains growth. How to foster growth is not an exact science and remains hotly debated. Instead of relying on Keynesian stimulus – which will not only be confrontational with European partners, but also an ineffective long-term strategy in an environment of great structural weaknesses – the new government should, in our view, prioritise three actions to revamp Italy’s ailing productivity and gear the country’s productive capacity towards the 21st century: human capital, e-government, and green growth. Human capital will be the key to successfully navigate automation, and more generally the increasingly rapid rate of change in professions. Scores on the recent Programme for International Student Assessment (PISA) suggest, however, that the Italian education system not only performs worse than the EU average, but also below what one would expect given the country’s income per capita. This is particularly the case in sciences, which is problematic given that science-, technology- and mathematics-related sectors are where employment growth is expected to rise more prominently going forward. As such, the first priority should be to take significant measures to improve educational attainment, primarily in Italy’s southern regions, which are characterised by substantially lower PISA scores than the rest of the country and the EU average. The second priority should be addressing the government’s institutional quality. On par with Hungary and Croatia, Italy displays one of the lowest levels of institutional quality of government in the EU (based on perceived corruption, efficiency, and impartiality). World Bank indicators likewise suggest that some of the largest competitiveness problems for Italian businesses originate from the length of civil proceedings and byzantine tax procedures. More formally, IMF research has shown how the low level of government efficiency in Italy has had spillover consequences for firms’ productivity. Pushing through an aggressive e-government agenda would be a new way to help alleviate these old and well-known problems. For example, it has been shown to be an effective way to combat corruption. The basic idea is that e-government not only increases the efficiency of the public sector, but makes it harder to be corrupt as electronic traces are visible. Currently, only 12% of Italian citizens have declared their using the internet for sending filled forms to public authorities. As this is the second lowest score in Europe, clearly improvements can be made. Rolling out a full-blown e-government initiative in Italy would be costly. 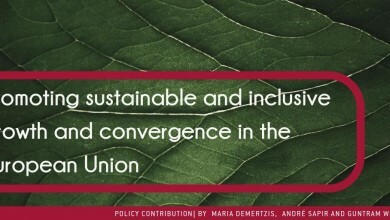 To finance this improvement in an administrative and institutional capacity, Italy could well take advantage of EU financial support, most notably through the recently established European Structural Reform Support Programme and the foreseen increase in funding for structural reforms in the next EU budget. A push by the new Italian government to reform its public sector would certainly be welcomed by European partners, unlocking funding for these measures. The third priority should be to invest in sustainability and green growth. The coalition agreement put forward an ambitious agenda for the promotion of the ‘green economy’. This entails major investments in energy efficiency, renewable energies, clean mobility, sustainable waste management systems and environmental protection. As illustrated by the OECD, combining economic reforms with ambitious climate policies in an integrated, synergistic manner can indeed spur economic growth, but it is also costly. Luckily here, again, there is scope for support from the EU. The European Investment Bank and the Juncker Plan provide cheap funding opportunities in this field. The new government should exploit them. Measures addressing these three priorities should be taken with particular attention to the poorer southern regions of the country, which display significantly lower metrics in all three fields. These three priorities have the positive characteristic of being fully compatible with the governments’ agenda. Some of these, particularly e-government, can be an important point of convergence between the two parties, given that one (the League) champions the idea of reducing government costs while the other (M5S) campaigned on curtailing corruption and is a technology enthusiast. Moreover, as illustrated, this reform agenda could benefit from EU co-financing. This brief growth agenda is geared towards what is directly in the government’s control. Of course, other measures would also be needed to boost Italy’s productivity, with the aim of improving the flow of resources to the most productive firms in the economy and ensuring that those firms have the conditions in place to expand. On March 4th, Italians sent a resounding message in favour of a break with the past. The ultimate test for the new ‘government of change’ will be whether it succeeds where all others have failed over the past two decades: bringing the country back to growth. While not exhaustive, our proposed priorities could provide a starting point for a discussion of a positive growth agenda. Italian citizens and European friends certainly want to see the new government succeed in making Italy grow again.